Should You Choose Shutters, Shades, or Blinds in Oakland Park, FL? When you are ready to improve your window coverings, then you need to start by choosing the category of products that will work best for your family. It is easy to jump to conclusions and assume that you should buy the cheapest products. But, don’t miss the opportunity to upgrade the quality of your Oakland Park, FL home with high-quality shutters, shades, or blinds. Our team at Open House Interiors is working hard to improve the style and function of window coverings in the area. We know that the quality of your window coverings will influence the appearance of your home. Additionally, these products play a big part in the function of your windows. Our friendly staff is here to answer your questions and offer personalized recommendations based on your needs. Blinds: This window covering is created with cords and horizontal slats. But, there are a few designs that use vertical slats instead. When the cord is pulled, the slats are moved to cover or expose the window. 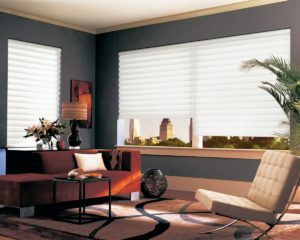 Blinds are versatile, with different price points and materials that can be used for the products. Shades: The next step up is to consider window shades. Instead of using slats, shades are created using fabric that pulls over the surface of the glass. You can choose thick fabric or a sheer texture that brings in a little bit of light. The fabric usually wraps around a rod when the shades are opened. Or, you can choose shades with pleated fabric when they are opened. There are two main benefits to shades. First, they are affordable. Second, you can choose the fabric that will complement the style of your home. Shutters: A high-end solution for your home involves elegant, beautiful shutters. These products create the perfect finishing touch to a beautifully designed room. Shutters are built with strong slats, usually made of wood or other materials that look like wood. A rod runs through the middle to connect all the slats and manage the movement of the window coverings. There are pros and cons to each of these designs. So, it is important to consider the unique needs of your family before you choose window coverings. For example, families with small children and pets might choose shutters to avoid the need to install window coverings with cords or ropes. Loose pieces could cause harm if the child or animal is caught up in the cord. Before you choose materials and features for your windows, we invite you to envision the perfect style for your home. Look through pictures and visit our showroom to get an idea of the options that are available. Then, talk to our team to source the materials that will match your vision. Even though window coverings might seem like a practical necessity for your family, they can also help you create a luxurious environment. Use these materials to improve the appearance of your home, so that you love the place where you live. In addition to stylistic features, also look for elements that will improve the durability of your window coverings. If you are going to spend money on new window coverings, then be wise with your spending and choose products that are going to last. Cutting corners with cheap blinds means that you might be facing expensive replacement costs later. These cheap products could easily be broken or damaged by pets or kids. Often, the damage is not repairable without replacing the entire window covering. On the other hand, some products hold up against normal wear and tear. Shutters are a great example because they are built with strong, durable parts that will look good for many years. It makes sense to invest in products that will hold up and provide excellent value for the money that is spent. Don’t pick cheap materials just to save a little money. Instead, optimize your results with materials that will offer the best value and quality.